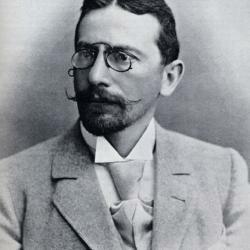 The most influential chess teacher of his time, Siegbert Tarrasch was also one of the most knowledgeable players as well. He wrote many chess books and made chess improvement accessible to the average player. His contributions to opening theory continue to be used even nowadays. Despite losing against Emanuel Lasker in his only shot at getting the world champion title, Tarrasch kept persevering and continued to be one of the leading players in the world. Siegbert Tarrasch was one of the top players throughout his life despite working as a medical doctor and never becoming a full-time professional chess player. He won four consecutive major tournaments but had to continue to wait for his shot at playing a world championship match. It wasn’t until 1908 that Emanuel Lasker gave Tarrasch his opportunity to challenge for the title and Lasker ended up winning the match easily. Tarrasch is best known for his teachings and battles against the hypermodern school. He based his teachings on Wilhelm Steinitz’s ideas about the center and focused especially on piece mobility. This was compared to the hypermodern school that put less emphasis on occupying the center and more focus on controlling the center from afar. Both of these schools eventually ended up working together though. Tarrasch passed away on February 17, 1934.